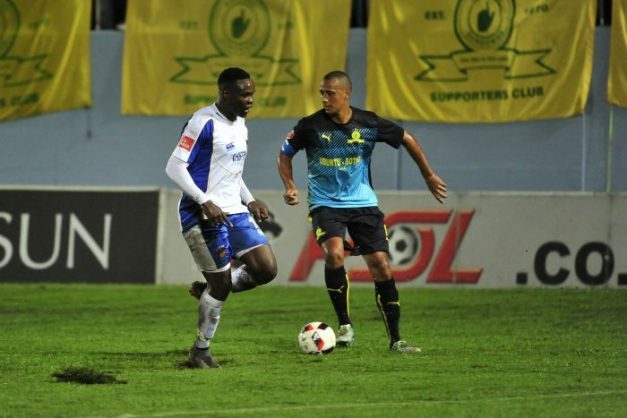 Chippa United held their own to earn a point against Premiership and African champions Mamelodi Sundowns after a 1-1 draw in an Absa Premiership fixture played at the Sisa Dukashe Stadium on Tuesday evening. The Port Elizabeth-based club dragged Sundowns to a venue in Mdantsane, township situated between East London and King William’s Town, for this fixture. Conditions were tough, with the field cut up and soggy, and certainly not conducive to passing football. Nevertheless, both teams gave their all and, in the end, a draw was probably a fair reflection of the action on offer. Chippa had a few promising moments early on, but were kept in check by Sundowns’ defence of Fares Hachi, Soumahoro Bangaly and Wayne Arendse. It was at the other end, however, where the opening goal arrived and it was Cape-born defender Arendse who scored to give Sundowns the lead. The setback galvanised Chippa into action and they poured forward in search of an equaliser. The Sundowns defence, while under pressure at this stage, held firm and ensured that they retained the advantage. Something had to give, though, and it was the goal-scorer Arendse who was then adjudged to have fouled a Chippa attacker in the penalty area in the 33rd minute. Rhulani Manzini stepped up and slammed the spotkick into the back of the net to level the score at 1-1. Five minutes before the break, Sundowns went close via a free-kick from Hachi, but the Chippa defence was able to avert the danger. Four minutes into the second half, the Pretoria side had a great chance to take the lead again when Algerian Hachi played in Teko Modise, but the veteran midfielder ballooned the effort over the bar. In the 60th minute, Yannick Zakri had another chance to score for Sundowns, but struck his shot into the side-netting. With Sundowns in need of some inspiration, they looked to the bench, with Thapelo Morena coming on for Modise in the 62nd minute. The impressive Hachi continued to cause Chippa problems down the left and, in the 68th minute, he crossed for Zakri, but the Ivorian stabbed the chance wide. Further changes for Sundowns then saw Zakri come off for Tebogo Langerman and Asavela Mbekile replacing Themba Zwane. Chippa, though, were always dangerous on the break and, in the 88th minute, they had a wonderful opportunity, but Sundowns goalkeeper Wayne Sandilands saved to deny Linda Shiba from scoring.